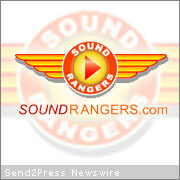 SEATTLE, Wash. — Soundrangers announces the launch of their new web site. Founded in 1998, Soundrangers.com was the first online sound library to specialize in creating royalty free sound effects and music specifically designed for the emerging world of interactive and online media. From the beginning their focus was to provide high quality sound effects and music for bandwidth sensitive applications such as video games, websites and software while utilizing a website delivery system focused on quick and easy sound auditioning, selection and download. As more and more traditional media, such as film and television, are becoming available online, Soundrangers continues to grow to accommodate the evolving uses of sound content in modern media. Soundrangers.com introduces several innovations with their latest web site update. Users can now create playlists or collections of sounds known as Soundboxes. These Soundboxes can help organize sounds per project, can be shared with others or sent to clients for approval. With refinements to navigation and audition systems, users can easily find and audition any sound from any page on the site in moments. An expanded user’s account area has streamlined viewing order history, sending copies of invoices, downloading and re-downloading of purchased sound effects and music files. Adding prepaid funds to accounts allows multiple users access to the library without the hassle of tracking individual company credit cards or multiple POs. Users can also access prepaid funds across multiple accounts so individuals sharing funds don’t need to all use the same account. Everyone from web designers, game developers and software makers to podcast producers and film makers, know that high quality sound effects and music can help distinguish products in the competitive high-tech and entertainment industries. However, trying to find or create sound content that will work with the unique demands of interactive and online media can be a challenge. Soundrangers continues to lead the way, making finding and using sounds easier than ever. Soundrangers is a Seattle-based company that creates all original royalty free music and sound effects optimized for both interactive and online media. They sell these sound files via their website http://www.Soundrangers.com. Soundrangers also provides custom sound design and music for clients such as Eidos, Postopia, Nickelodeon, Cartoon Network, Electronic Arts, Activision, Microsoft Game Studios, Compaq, Hewlett-Packard, and Nintendo.